Depending on your history and symptoms, we may take X-rays. X-rays help us rule out serious health problems which may need medical attention. They also allow us to develop the most effective treatment plan for you and help make our adjustments as specific and accurate as they can be. Most people are amazed once they see their X-rays up close. 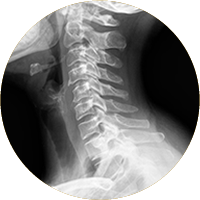 Chiropractors are trained in both radiology (making diagnose from X-Rays) and radiography (taking X-Rays). As a Gonstead practitioner (an advanced chiropractic technique) Dr O’Sullivan-Drummond also uses the X-rays at peterborough chiropractic to identify exactly which bone is displaced and how; this information is then used to calculate the exact adjustment needed to put the bone back to its correct position. Excellent HD image quality helping us to identify details normal X-Rays can miss. The images can be edited to identify the specific misalignment of the bone and help explain to you what issues are visible on the image for your better understanding of the problems we face. Lower radiation exposure, a similar dose to that of a transatlantic flight. Instant results so that you can find out the next day of the cause of the problems and start treatment imminently. Easy transfer of the images to your medical Doctor and multiple copies can be transported with no risk to loss or damage of film images. More environment friendly as no toxic film development chemicals are used in this process. CD copy of your images. For a small fee you can have a copy of your images.